The exterior door of your home or office is the door to your life. It represents your safety, and you cannot take it lightly. That is why your exterior door repair is critical. Do not neglect the entrance to your safety and tranquility. If your entry door needs repair, do it now. There are few reasons why people need an exterior door repair. Typically, it is associated with vandalism or an incident where the entrance was forced, damage caused by water, an unexpected hit, usually with a heavy object or abandonment and lack of maintenance. Vandalism and criminal acts or natural disasters cannot be avoided. Accidents can be prevented as well as the lack of maintenance. Before we go any further on why your exterior door repair is necessary, let’s take a look at where can you ask for the required repairs for your exterior doors. Depending on where you are, there are different recommendations to fix exterior doors. Most wooden doors would require calling your trusted carpenter. Some other type of doors might require other specialized men, like a blacksmith. Then, depending on the kind of problem, you might also need a locksmith. In sum, you should have a whole directory of handy men to help you with your repair problem. Another approach is to call a company specialized in doors. 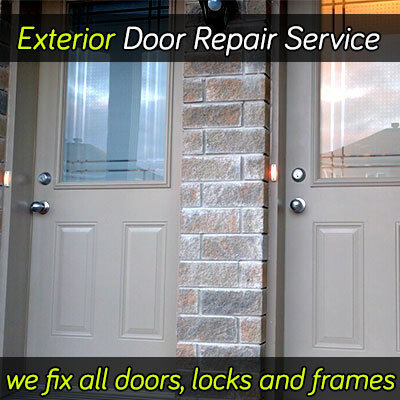 For the greater Vancouver BC area, 24hr Door Repair is a great option. You would not have to worry about which specialist you need because we have them all. The kind of damage that requires an exterior door bottom (door threshold) repair is typically associated with a substantial hit. The bottom of a door is one of the most vulnerable parts. A heavy object falling can easily damage it. A ball or even a kick also are more prone to hit bottom. Depending on the damage, the repair can take just some wood putty and paint, or even the replacement of a section of the door. If it is a steel door, then the damage is most likely the result of rust. Preventing it is easier than repairing. However, the recipe is similar. You would need a metal patching plus painting, or in the worst case, the replacement of a section. The door frame is one of the most vulnerable parts of a door. To repair broken exterior door frame is important because if you don’t, then the door function will be diminished. The door frame can easily break when applying excessive force. Depending on the structure’s design, breaking it can be easier or harder. The most protected the frame is the better the security, especially when it comes to commercial entry doors. The most extreme damage is a rotten frame. However, it is rare. You can prevent such damage with regular maintenance. Only applying paint to an entrance door would guarantee long and lasting years of usefulness. Wood is a resistant material, but it is not infallible. There are two reasons why wood fails. The first one is the result of human manipulation. The door is damaged in porpoise for the wrong reasons, and there is not much you can do about a situation like that. The second situation is the result of natural disasters and weather damage, such as water damage in case of flooding or even rain. An entrance door is more prone to such damages because it is on the outside. It needs regular maintenance to keep it functional. Metal doors are more resistant than wooden doors. They are not damaged easily by human hand. Moisture is the most common problem with metal doors. They rust, and if it happens, they deteriorate easily. To keep them painted is important to prevent such problems. In exterior doors, that is of particular importance.